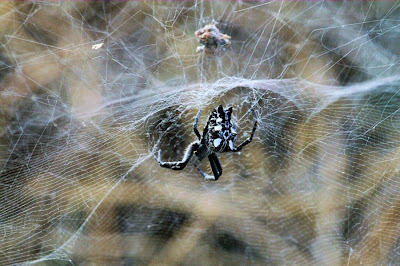 Tent-web spider Cyrtophora citricola, copyright Ed Nieuwenhuys. Cyrtophora is a mostly Indo-Australian genus of spiders (with some species in Africa and the New World) whose members construct a horizontal orbweb with a tightly woven mesh and an extremely tight, permanent non-sticky spiral (Framenau & Scharff 2009). Characters (from Framenau & Scharff 2009): Lateral eyes slightly separated; posterior eye row recurved or straight; legs relatively heavy; fourth leg with combined patella and tibia slightly shorter than femur, and shorter than combined metatarsus and tarsus; male pedipalp with embolus placed near median apophysis, supported by a conductor, basal cymbium concavity absent; female epigyne lacking a scape.